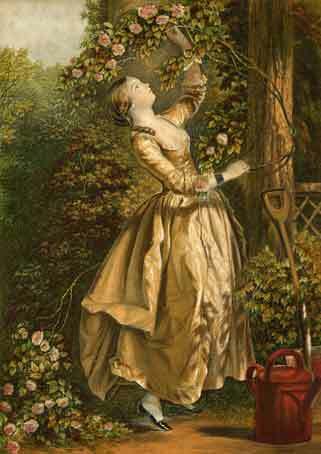 It is taken from a large watercolour by Edward Corbould and is said to represent a scene from Tennyson’s poem; "The Gardener’s Daughter". And mix’d with shadows of the common ground! Baxter Process Print, size 6 x 4 1/4 ins. Baxter's original publication is Signed on the ground, on the left, “Published Dec. 1, 1856, by G. Baxter, Proprietor & Patentee, London,” in two lines. This print was produced from ten blocks, and was originally sold at 1s. 6d. The print was included in the Baxter, Vincent Brooks, Vincent Brooks, Day & Son, and Le Blond republication issue lists.